Description of "Practical Acceptance Sampling"
Practical Acceptance Sampling is a hands-on introduction to the inspection of products and services for quality assurance using statistically-based sampling plans. In today’s era of global supply chains, the path from raw materials to final product often takes place over multiple companies and across multiple continents. Acceptance sampling is key in the 21st century environment. Acceptance sampling plans provide criteria and decision rules for determining whether to accept or reject a batch based on a sample. They are therefore widely used by manufacturers, suppliers, contractors and subcontractors, and service providers in a wide range of industries. The book introduces readers to the most popular sampling plans, including Military Standards and civilian ISO and ANSI/ASQC/BS standards. It covers the design, choice and performance evaluation of different types of plans, including single- and double-stage plans, rectifying and non-rectifying plans, plans for pass/fail and continuous measurements, continuous sampling plans, and more. Practical Acceptance Sampling is suitable for courses on quality control and for quality practitioners with basic knowledge of statistics. It offers clear explanations, examples, end-of-chapter problems, and illustrations of state-of-the-art online resources. Methods are illustrated using Microsoft Excel, online calculators, and www.SQCOnline.com . However, any statistical software can be used with the book. New to the second edition: A section on Acceptance-on-Zero plans, additional screenshots from the newly-designed SQCOnline.com with several new calculators, and improved book design for enhanced readability. 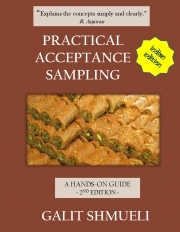 Reviews of "Practical Acceptance Sampling"